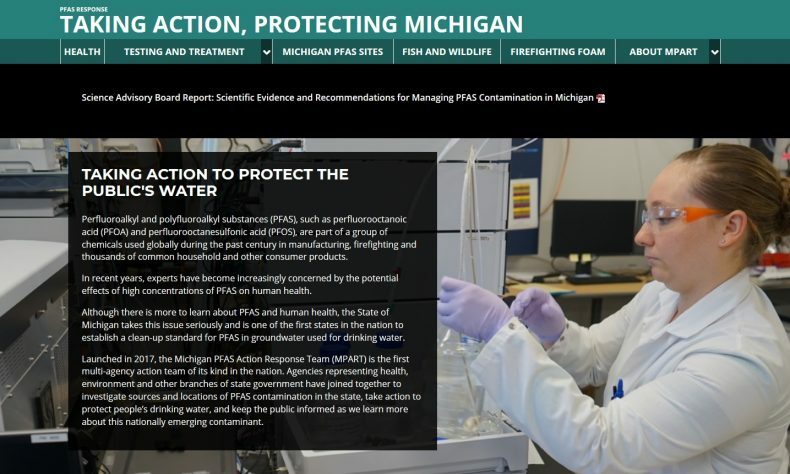 LANSING—The Michigan PFAS Action Response Team (MPART) today named three environmental and health experts to a Science Advisory Workgroup to review existing and proposed health-based drinking water standards from around the nation for per- and polyfluoroalkyl substances (PFAS). The Science Advisory Workgroup is under a July 1 deadline to develop health-based recommendations for the Michigan Department of Environmental Quality (MDEQ) to consider as part of its rulemaking process for Maximum Contaminant Levels (MCLs) for PFAS in drinking water. David Savitz, a professor of epidemiology at Brown University in Providence, R.I., who will chair the work group. He also serves as associate dean for research, and holds joint appointments in obstetrics and gynecology, and pediatrics in the Alpert Medical School. His epidemiological research has addressed a wide range of public health issues including environmental hazards in the workplace and community, reproductive health outcomes, and environmental influences on cancer. He has done extensive work on health effects of nonionizing radiation, pesticides, drinking water treatment by-products, and perfluorinated compounds. He is the author of nearly 350 papers in professional journals and editor or author of three books. He was president of the Society for Epidemiologic Research and the Society for Pediatric and Perinatal Epidemiologic Research, and North American regional councilor for the International Epidemiological Association. Savitz earned a Bachelor of Arts in psychology from Brandeis University, a Master of Science in preventive medicine from Ohio State University, and a PhD in epidemiology from the University of Pittsburgh. Kevin Cox, a managing toxicologist at NSF International in Ann Arbor. His areas of work have included health effects assessments for drinking water contaminants, dietary supplements, toy products, and pool and spa chemicals. Prior to his current role, he was the supervising toxicologist for NSF International’s drinking water additives and dietary supplement certification programs. Cox received his Bachelor of Science in biochemistry and history, and a Master of Public Health in environmental health sciences-toxicology, both from the University of Michigan. He currently is an associate member of the Society of Toxicology. He also has a J.D. from the UM Law School and is a member of the Michigan Bar Association. Jamie DeWitt, associate professor in the Department of Pharmacology & Toxicology of the Brody School of Medicine at East Carolina University in Greenville, N.C.. Her laboratory’s research program explores relationships between biological organisms and their responses after exposure to environmental contaminants, with a specific focus on the immune system and its interactions with the nervous system during development and adulthood. The research program particularly focuses on emerging aquatic contaminants, especially per- and polyfluoroalkyl substances (PFAS). With respect to PFAS, DeWitt has published 13 primary research articles, six review articles, two book chapters, and edited a book on PFAS toxicity. She has served as an external reviewer for the U.S. Environmental Protection Agency (EPA) health effects assessment of perfluorooctanoic acid (PFOA) and perfluorooctane sulfonate (PFOS), the U.S. National Toxicology Program’s immune effects assessment of PFOA and PFOS, the U.S. Agency for Toxic Substances and Disease Registry toxicological profile for PFASs, and was a member of the International Agency for Research on Cancer working group for the assessment of the carcinogenicity of PFOA. Her laboratory currently assesses the immunotoxicity of emerging PFAS that have been designed to replace those that have been phased out of production and that are of concern in North Carolina. She double-majored in environmental science and biology for her bachelor’s degree from Michigan State University and has doctoral degrees in environmental science and neural science from Indiana University-Bloomington. The health-based values will be provided to MDEQ who will, with the input of stakeholders, create administrative rules. The draft rules are expected to be developed by October 1, 2019, and adopted in the spring of 2020. PFAS were once widely used in nonstick cookware, firefighting foam, waterproof clothing, food packaging, and other consumer products. There is scientific evidence that the compounds affect the growth, learning, and behavior of infants and children, interfere with fertility, increase cholesterol levels, damage the immune and hormonal systems, and increase cancer risk. A federal recommendation last June backed reducing the limit to 7 parts per trillion for PFOS and 11 parts per trillion for PFOA. The state’s MPART investigation includes sampling dozens of locations across the state, including industrial buildings, military bases, and landfills known to have used or disposed of PFAS-containing materials MPART is now investigating more than 43 sites with known sources of PFAS contamination across the state. In 2019, Gov. Gretchen Whitmer strengthened MPART by reestablishing it under Executive Order 2019-3 as a permanent body within the MDEQ.